Whats up guys. I hope you enjoyed that quick into. As you can see I’m reviewing a case today and the case I’m reviewing is the TigerShark from Raidmax. This is my first case I’ve ever reviewed and I would like to thank Syntech for lending me the case to do a review. Syntech is one of the major tech suppliers in South Africa. They supply a wide a range of brands like Crucial, Antec, Speedlink, Western Digital and then they are also the exclusive supplier of Redragon, a brand we really like here on We Do Tech. Starting off, the case is made out of lightweight steel and plastic. And looking at the Tigershark the first thing you probably notice is the 2 handles at the top. These handles make it a lot easier to carry the case, which makes it perfect for a gamer who goes to LANs a lot. Also at the top, you get some vents for better airflow. Then at the bottom you get 2 large stands which resemble the top handles, but please don’t go and get confused and put the case upside down, I don’t think that would really work. But joking aside the 2 stands does a good job of keeping the case steady and lifting it up for better airflow at the bottom. Looking at the front of the Tigershark, you get a single DVD writer bay, that has its own button and flip down door. So if you were planning on using other 5.25” bay accessories, your out of luck. But, the front IO does have some nice features. You get 3 USB port, 1 USB3, and 2x USB2. Next, to that, you get a headphone and microphone input. Then something I really like is an SD and MicroSD card reader. This is extremely useful if you take a lot of photos or videos and don’t want to connect the entire device to your computer. You can just take out the SD card, plug it in and there you go. You also get a fan controller so you can turn you case fans off or let it run at LOW or HIGH RPM. Then lastly you get the reset and power button. The side panel has a tinted acrylic window with space for a single 120mm fan. Also at the top and the side you get a red grill that will work for an intake or exhaust. I really like the red tint it adds some more flare to the case. But looking at the other side, you get a bit of a bulge for better cable management and then the same 2 red grills. To remove the side panels all you have to do is unscrew the 2 thumb screws on each side and slide off the panel. Look at the inside of the Tigershark, you get 3 removable drive bays, that can take both 3.5 and 2.5-inch drives. All you do is pull out the bays and screw in the drives. I personally still like screwing in the drives, it just feels more secure. And I always struggle with tool-less ones. The 5.25” bays at the top, comes with a tool-less lock in clip, to secure your DVD writer. You only get one lock for the 3 bays and at the front, there’s only an opening for a single DVD writer. So I’m not too sure about this, but if you do have something you can slide in there, then there you go. The space between the top and bottom bays make it so that you can fit any GPU so you don’t have to worry about that. You are able to fit an ATX or smaller motherboard inside the case, with up to 7 PCI slots. The power supply is mounted at the bottom and a nice feature more and more cases are getting is a dust filter for the power supply so that it can pull air from the bottom. So how many fans can the Tigershark handle? Well, you have a single 120mm at the back which is included, then you also have space for 2x 120mm or 1x 140mm at the top. The top also has a built-in dust filter, to keep your system dust free. You are also able to mount 2x 120mm at the front or even a single 120mm RAD. Then lastly you can add a single 120mm on the side panel as well to cool down your GPU. Because Syntech is only leading the case to me I didn’t want to build an entire system into it, I don’t have any fancy RGB components anyway. 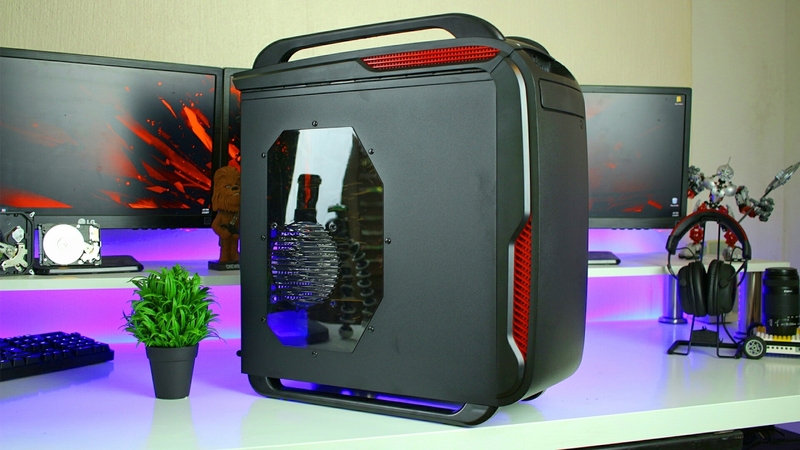 But I can already say that the Tigershark is a great budget case, it has enough space for a standard system and if you pop in some LEDs the case would look awesome. And with those handles, I know a lot of gamers will like it. Really the only thing I didn’t like was the 5.25” bays. I’m not sure what the use are for the other 2 because you can’t really use them. But I’m sure somebody will find a use for them. You can check out Syntech as well.